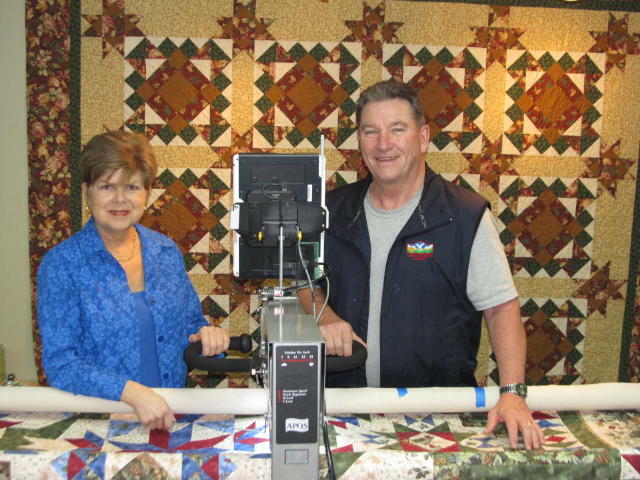 TLC Quilt Studio is a family-run business owned and operated by Susan and Bruce Taylor in Bedford, Nova Scotia. Susan has had an interest in sewing since the age of fourteen that has continued over the years. Even while juggling a nursing career and young family, she managed to sew for herself and her children and dabbled in everything from doing craft shows to sewing uniforms for nursing colleagues. It was inevitable that Susan would discover quilting! A “Great Start” beginners’ quilting course in 2002 at Lori’s Country Cottage in Sherwood Park, Alberta piqued her interest and started a new passion. By 2005, she was working part-time at “Lori’s”, teaching classes and even doing a bit of designing. Her original “Card Clutch” pattern has the distinction of being the best-selling ever at “Lori’s”. After 32 years living in Alberta, Susan has returned to her roots…she and her husband, Bruce moved to Bedford, Nova Scotia in 2008. After considering a number of options for a retirement business, they have found the perfect fit in TLC Quilt Studio and look forward to meeting and serving local quilters in the years ahead. Bruce’s professional background is in environmental consulting. He is relatively new to the quilting world but has become enamored with the long-arm quilt finishing side of things – consequently, Susan has a hard time trying to book any time on the ‘Milli’ long-arm! !